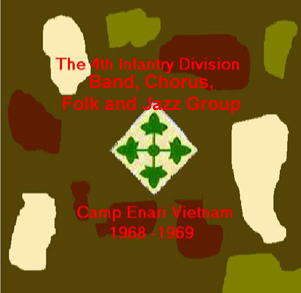 The 4th Infantry Division Band of 1968 had four performing groups. These groups sometimes played performances together but also traveled individually. The smaller groups like the Folk could more easily travel to remote fire bases than could a larger group of 30 or more men and their equipment. Members of the band, and the other groups, did perimeter guard duty, engineer details, participated in a number of "Sweeps", patrols from time to time, convoy guard duty and "house keeping" duties like KP and Charge of Quarters and such. The 4th Inf. Div. Band still exists and has been deployed to Iraq at least twice. Due to the danger of traveling in large groups, today most performances are done with smaller ensembles. Although mp3 files are smaller I have posted these recordings in wma format because the quality of the original tapes wasn't good and the tape had aged by the time I converted it to digital. The tape recorder used was a Sony 355 with two mikes and no mixing was available. The power supply was usually a diesel or gasoline powered generator that caused significant voltage fluctuations. None of our venues had studio quality acoustics. The Bandmaster was the late CWO Arthur Durham. Click the links below to visit and hear music by each of the groups.